The 68th annual convention for the American Vecturist Association was held in Oak Creek, WI on August 2nd through August 5th, 2018. What fun we all had. It was a great meeting to catch up with fellow collectors, which I consider good friends and their spouses. Catching up on events that have occurred over the past year is always such a plus when getting together. We started the convention with a board meeting on August 2nd. It was a very productive board meeting that was open to everybody including non-Board Members. During the board meeting, we decided that all the wives of members would be honorary members if they would like. Rich Mallicote, the president of our organization, will become the Convention Chairman with the assistance of two of the wives. My wife loved this since restaurants and shopping with the wives in a fun city is very important!! We also decided to invite local coin clubs to trade, sell and swap with us at future conventions. On August 3rd, we started our annual token-exchange in a private room in the hotel. Everyone was welcome. We stopped swapping rising for lunch and to get ready for a charter bus to pick us up and take us to our annual tour. This year we visited the East Troy Railroad Museum, and rode the East Troy Electric Railroad (the only remaining Electric Interurban Railroad in the country), which contains the remaining cars from the Chicago, Milwaukee, and St. Paul Line, which, from the early 1900’s until the mid-1950’s served the three cities which make up its name. What a fun filled and informative railroad ride. After the ride was over, there were numerous restaurants in the area that whoever wanted to could choose to have dinner at. Again, fun was to be had!! My wife commented to me how she noticed how happy everyone was and all the smiles on everyone’s faces. Saturday morning, at 9 AM, we had our annual auction of rare and hard to find transportation tokens. Afterward, we continued the token-exchange in our meeting room, then if you wanted to, you could go sight-seeing or shopping. This is one of the most beautiful areas in the Mid-west for sight-seeing and shopping. A lot of the spouses went to the Jelly Belly Factory for goodies and a tour. They also went to a cheese castle and shopped while the collectors did the token-exchange and the auction. Many of the spouses went on a walking tour in downtown Milwaukee and took pictures with a statue of “The Fonz”. Saturday night we had our annual dinner. The ladies love the annual dinner, this is the part of the convention where they can get dressed up for the evening. Plenty of good food, laughing and just plain ole’ camaraderie was the theme of the evening. Sunday morning we gathered for the Annual General Meeting. Members and non-members were in attendance. After the meeting, we took lots of pictures. With great sadness, we said our goodbyes and with a promise of “good times,” we look forward to the next convention. On a personal note, my wife and I went to a Cubs game, a White Sox game, and a Brewers game while up there. Of course, we dined on ice cold beer and hot dogs at the games! We ran into a couple of fellow collectors at each ballgame. We also went to the Field Museum in Chicago. Being a member of the AVA isn’t just about collecting and trading tokens, it’s more than that. It’s looking forward to going to the annual conventions. Going to different parts of the United States and learning all about the city that we visit. Seeing old and meeting new friends. Laughing and smiling for 3 – 4 days with people who share a common interest. OPA tokens were rationing tokens that were first issued on February 27, 1944, for rationing during WWII. In May of 1942, OPA stamps were used. 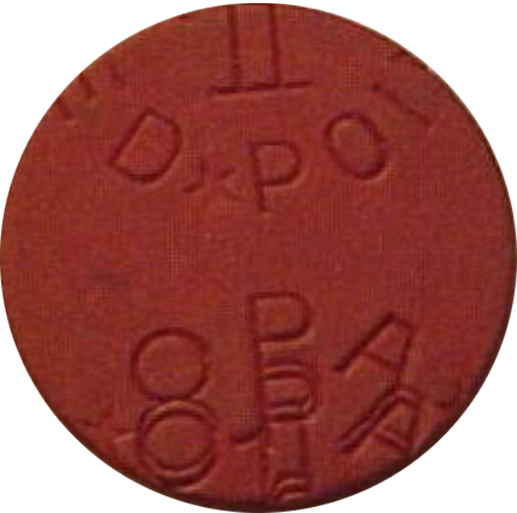 However, on February 27, 1944, the OPA token made its debut. The OPA token would now represent 1 point and an OPA stamp would be worth 10 of these new OPA tokens. OPA stands for Office of Price Administration. During WWII, OPA had another acronym. Office of Over Priced Administrators! The Office of Price Administration used OPA stamps, coins, and chits for rationing. Items that were rationed include canned goods, meats, sugar, coffee, tires, gas and more. 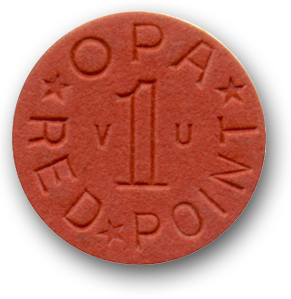 OPA tokens were used for rationing during World War II. OPA tokens were used by retailers to give change back for food bought with ration stamps. OPA tokens are either red or blue in color. Red OPA’s are a lot more common than blue ones. 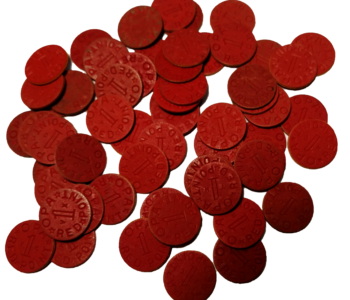 Blue tokens were used for processed foods and the red tokens were used for meats and fats. There are 30 different known red tokens and 24 known blue ones. Blue ones read: OPA Blue Point 1 (with two different letters) and the red ones read: OPA Red Point (with two different letters). No one has found a true reason for the letters on the OPA’s. Theories include, they are random, demographics and prevention of counter fitting. They are all vulcanized fiber (celluloid) and 16mm in size. Both the red and blue OPA’s have certain ones that are more valuable than the rest. Error OPA’s are worth a little more. The hardest letter combinations to locate are MV, WC, WH, and MM. I have seen the MV sell for as little as $125.00 on eBay and as much as $260.00 on eBay. They are the most expensive of the group so a complete collection would cost considerably less than most other Exonumia collections. OPAs were last used in 1945. Red OPAs may have stopped being used in December of 1944. Considering that a minimum of 900,000,000 blue and 1 billion red were made, they are a lot rarer than you would think. What is the American Vecturist Association? 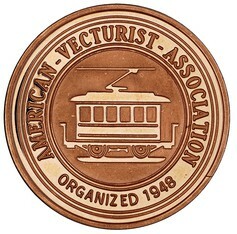 The American Vecturist Association is the oldest American organization of token collectors, formed in 1948. It is a friendly, informal group with members throughout the U.S., Canada, and worldwide. Membership is available at a very reasonable price by clicking here. There are quite a few benefits to members. The main benefit is being able to receive a copy of their monthly publication, The FAREBOX. The FAREBOX is published by the AVA and is the only publication devoted exclusively to transportation tokens. You can get a print or digital version. Because embers who opt for the digital version of the FAREBOX can save significantly. The AVA publishes several catalogs that cover transit, bridges and other transportation fares. These are available to members at large discounts off the regular price. Also available are books covering car wash tokens and land-company/ real estate tokens and Parking Tokens. Trading, buying and selling tokens. There is no charge to set up a table to sell tokens. Some members also sell tokens not related to transportation. In some cases, some transportation tokens are sold below the catalog price which is a great deal for members. A ride someplace in the area of the Convention. This can be a unique bus ride, train ride, duck boat, ski lift, etc. You receive that years AVA Tour token. 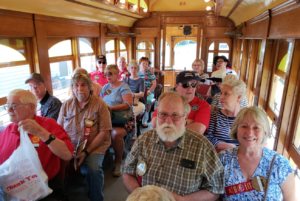 There are living members that have collected transportation tokens since the club was founded. Swapping stories is a fun part of all conventions. Each year we have an auction at the Convention which offers some very rare transportation tokens. There are also some hard to find, not rare transportation tokens to help fill in some of the holes in your collection. There is also a banquet that sometimes includes local transit experts. Very educational. As a member, you receive a complete membership list of all AVA members. This puts you in touch with fellow collectors around the globe. Your membership also makes you eligible for the AVA New Issue Service, making most new transit tokens as close as your mailbox, at very reasonable prices. You also get a CD with information about the history of the AVA created by one of the founders. As you can see, this is a great opportunity to grow your collection, find out the history of your tokens and meet and talk to people who share your interest.